PMP Pals Around the World Serve Their Communities! Pals Raise Funds for Appendix Cancer and PMP Cancer Cure Research! 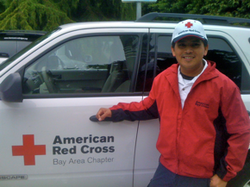 Pal Caregiver, Ron is a Red Cross Volunteer! Our Pal Ron is a registered nurse, a family caregiver, a member of the Pals' Advisory Council and still finds time to volunteer for the Red Cross! 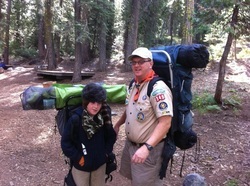 Pal Caregiver, Paul, is a Cub Scout Leader! Paul leads the local Cub Scouts Troop! Our Pal, Paul is the dad of three, a full time executive, caregiver for his wife, and still finds time to volunteer as a Scout leader! Pal and his family are participants in the Pals' Family Support Group! 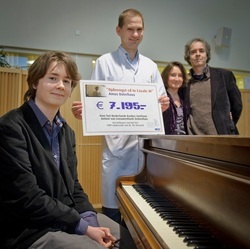 PMP Pal Son Raises 7,200 Euros for PMP Cancer Research! Amos presented Dr Verwaal with this check! Read how this 14 year old raised funds to support Dr Victor Verwaal's research after his dad was diagnosed with PMP! PMP Pal Jeannie, visits other Pals in the hospital! 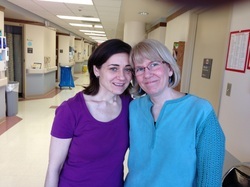 Here's our Pal, Jeannie, visiting Pal Marina, in the hospital and offering encouragement and hope! PMP Pals Mike and Adele, visit other Pals in the hospital! Pals Mike and Adele, serve as Pal Mentors and take time to visit recuperating Pal patients in the hospital! Our Pal, Andy, center, and his family, raised more than $5,000 to support the research of Dr Laura Lambert (far right) in September 2012! 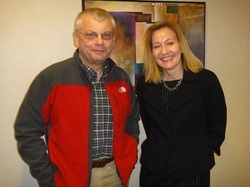 Pal Andy, with his friends and family, raised $5,000 to support Dr Laura Lambert's research, Fall 2011! Read how you can donate to support PMP Cancer Research! 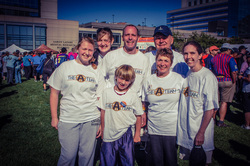 Pal Families and friends participated in Heat it to Beat it 2011! PMP Pals who are "veterans" of surgery with Dr Sardi, and their loved ones, gathered to support Dr Sardi in his research program during the annual Heat it to Beat it Walk 2011 and funds in support of Dr Sardi's research! 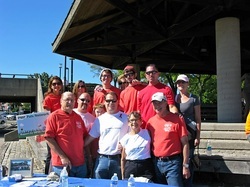 PMP Pals Raised $7,000+ to Support Heat It To Beat It 2011! Liz recuperated from surgery earlier this year and Chris recuperated six years ago! Pal Patients Liz and Chris each successfully recuperated from CRS HIPEC and now encourage newly diagnosed patients! Pal, Misty, Quilts for Cancer! Our Pal, Misty's quilts, are raffled to raise funds for cancer patients in her community! Pal Patient, Misty, has successfully recuperated from CRS HIPEC and now serves as a Pal Mentor to newly diagnosed patients! Learn how you can become a "PMP Pal!"